Omkar Madhata Temple: One of the sacred shrines in India, this Temple houses the 4th Jyotirlingas out of the 12 Jyotirlingas. This Temple is located on a beautiful confluence of River Narmada and River Kauveri. The temple structure is a finest example of Nagara Style Architecture which is decorated with elegant Frescos and Carvings. The landscaped balconies over the engraved columns of this temple add to its existing beauty. The Temple is encircled with the holiest rivers on the Mandhata Island and offers a panoramic view of the surroundings. This temple has great importance as its name is repeatedly listed in the ancient Puranas. It is beautifully lit up during various festivals like Mahashivratri and Kartik Poornima that are celebrated with great spirits and harmony. It also has the temple of Panchmuga Ganesha which is located on the first floor. Panchmuga Ganesha Temple also forms one of the most important tourist attractions of this place. Don't forget to visit the Mammaleshwar Temple / Amareshwar Temple which has the other half of the Jyotirlinga as mentioned in the Puranas. Mammaleshwar Temple is located on the banks from where one takes the ferry to the temple. 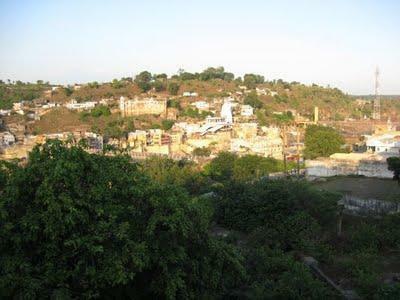 Siddhanath Temple: Siddhanath Temple is also one of the famous temple here, which is dedicated to Lord Shiva. Siddhanath Temple boasts of Brahminic Architecture and is an artistic talent related to the Medieval Period. Siddhanath Temple is located on a plateau on the Mandhata Island and is supported by intricately embellished Podium. The podium is exclusively carved and adorn frieze of elephants in various postures carved on a stone slab. 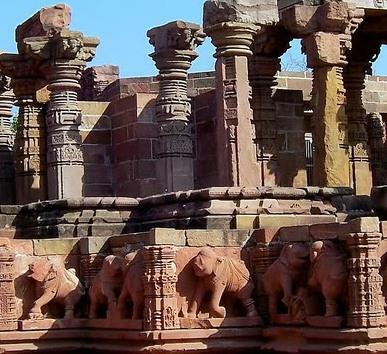 These elephants are the main attractions of Siddhanath Temple. The main shrine where Lord Shiva houses is in the center and has facades from all the four sides which are adorned with spectacular figures and decks. The Siddhanath Temple was severely damaged by the Mughal invasion but later on restored by the Marathas. 24 Avatars: 24 Avatars is one of the most prominent and most visited sacred sites in this place. The 24 Avatars is a cluster of large group of Hindu Temples and Jain Temples which showcase a unique style of architecture. Each and every temple out of these cluster speaks of a unique beauty and artwork set in the Medieval Period. Kajal Rani Caves: Kajal Rani Caves are located around 9 km from here. Kajal Rani Caves rest amidst scenic landscapes and are extremely picturesque. The location of Kajal Rani Caves makes the trip extremely relaxing and one should definitely pay it a visit. The Kajal Rani Caves forms a major Tourist Attraction and an ideal Picnic Spot as the caves are located within the natures lap. Mandu City: Located 100 km from here is Mandu City – The famous City of Ruins. Mandu City is known for its cluster of forts which form the major tourist attractions of the area. Mandu Fort in Mandu City is one of the strongest and oldest forts in India and has attracted tourists from all around the world. There are many attractions inside Mandu Fort which include the famous Jahaz Mahal which is located on the banks of River Narmada, the Pavilion of Rani Roopmati and the Jama Masjid. Mahakaleshwar Jyotirlinga: Mahakaleshwar Jyotirlinga – One of the famous 12 Jyotirlinga is located in Ujjain around 130 km from this place. The Mahakal Temple of Mahakaleshwar Jyotirlinga is a temple to Dakshinmukhi Linga (South faced) and forms one of the holiest shrines of India. Pilgrims make it a point to visit Mahakal Temple after visiting this place. Rajwada Palace: Rajwada Palace is located 77 km from this place. Rajwada Palace is one of the most prominent tourist attractions. Rajwada Palace is a royal palace built by the Holkar Rulers during the 19th Century. 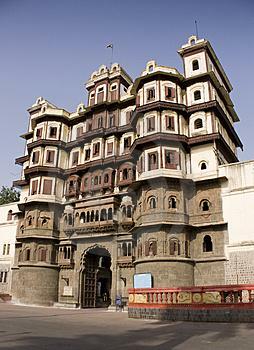 Rajwada Palace is a fine example of Royal Grandeur and excellent architecture work during those times. Rajwada Palace manages to attract many tourists from all over the world. Other than the above, there are many other structures and temples which can be visited, which include the Satmatrika Temples which is located 6 km from the temple and is a group of 10th Century Temple, The Raanmukteshwar Mandir which is located within the Confluence of River Narmada and Kauveri, the Sacred Meeting Point where both the holy rivers meet, Kedareshwar Temple which is fine example of 11th Century architecture and Gauri Somnath Temple which is one of the oldest and popular shrines in this place. this place has generally faces extreme climatic conditions with hot summers and cold winters. This Temple is at its best when visited during winters. From post monsoons, one can visit this famous Jyotirlinga located in Madhya Pradesh. The climate during summers reaches at the temperature of 37 degrees Celsius to 45 degrees Celsius, which can get too hot for the pilgrims to visit the temple. But the scenic surroundings of the Mandhata Island gets better with post monsoons, as the island gets dense with lush greenery as the monsoon spells magic on it. During Monsoons, the level of Narmada River gets bit higher than the regular level. This could be dangerous and inconvenient for pilgrims who wish to take the ferry. Also the Mandhata Island receives heavy rainfall. And hence it's ideal to visit this temple during its best time which is from October to March. The festive seasons here also happens to be during this time. Thank you for the detailed information. 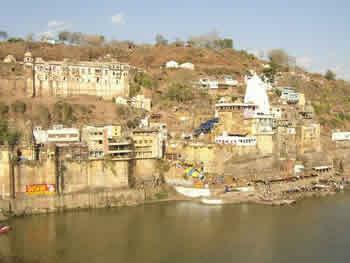 We are planning to visit Omkareshwar in April or May. Is it a good time to visit this place? We are a big group of 7 people. Which is the best place to stay there? We just want a decent place to sleep and no luxury needed. We are on a tight budget. Please suggest some budget hotels to stay.